Tuesday 5th August 2014. 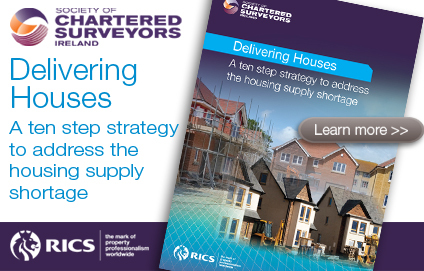 The Society of Chartered Surveyors Ireland has published a ten step housing strategy document which it says will support a quicker delivery of new homes to meet the supply shortage which exists in Dublin and other urban areas. The measures include the introduction of a Builders Finance Fund, a reduction on VAT for new home construction, the establishment of a Revolving Infrastructure Fund and a reduction in development contributions to local authorities for a period of two years. 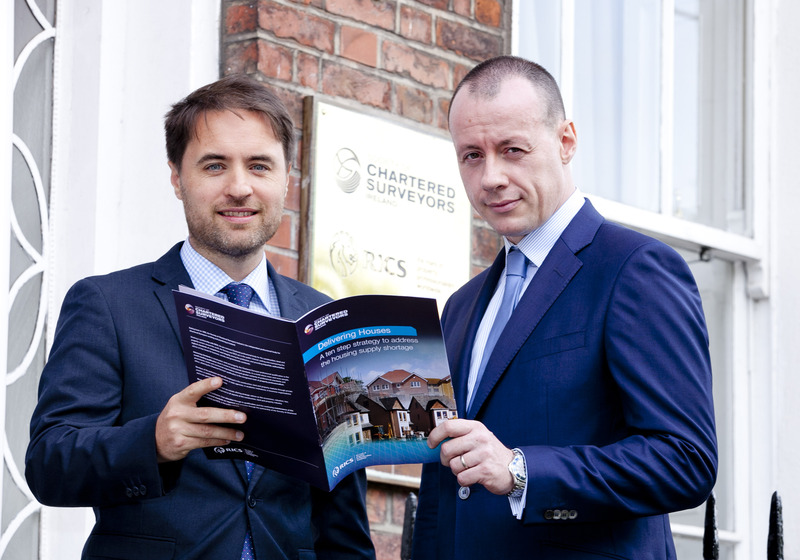 Recently the SCSI expressed concern at rising house prices and the low level of house building currently being undertaken. The latest CSO house price figures show that house prices in Dublin are 24% higher than a year ago and the Society says this is simply not sustainable. Only 8,301 new houses were built in Ireland last year while the Housing Agency has pointed to a need for 80,000 units over the next 5 years, or approximately 16,000 per annum with half of those required in Dublin. The Chairman of the Residential Group of the SCSI, Simon Stokes, pointed out that new houses cannot be supplied on tap and that the lead in time through construction and to completion generally takes a minimum of two years. He said the upcoming budget provided an ideal opportunity to implement these measures. “Our strategy document focuses on practical steps which can accelerate the delivery of new homes. There is a lack of development finance for builders but the Government could address this by establishing a Builders Finance Fund. In the UK a BFF fund of €660m has been established to help smaller builders and to speed up housing developments of between 15 and 250 units which have slowed down or stalled. “A reduction in the VAT rate for the hospitality sector worked extremely well here in recent years, boosting the tourism sector and helping to create 15,000 jobs. We believe a reduction in the current 13.5% VAT on new homes to 5% for a period of two years could have a similarly positive impact on house building and job creation. “The need to fund infrastructure in advance of a development being completed is a significant barrier to unlocking supply and we believe the creation of a Revolving Infrastructure Fund could address this issue. RIF’s are not grants or subsidies but a smart way of providing financing for developments. Once they’ve been repaid the money can be reinvested to pay for infrastructure on further projects. Together these measures would ensure an adequate supply of houses, kick start the construction sector and create employment” Mr Stokes said. Other measures which the Society believes would be useful are a reduction in development levies paid to local authorities and the index linking of such levies so that they move in line with market changes. A reduction in the windfall tax on the sale of land from 80% to 33% to bring it in line with Capital Gains Tax and the introduction of a vacant site levy on sites of strategic importance could stimulate development, particularly on sites already owned by the Local Authorities. The SCSI also recommends that NAMA issue licenses to developers to build on viable sites in strategic locations while it says a streamlining of the planning process would speed up decisions. The Society also recommended a number of measures which it believes would help reduce the demand for houses. For example a Local Property Tax exemption for people ‘trading down’ to smaller units would increase the availability of second hand homes. This would also happen if greater action was taken by the financial institutions on reducing the number of mortgages in arrears, particularly in the ‘Buy to Let’ sector. Simon Stokes also pointed out that if future apartments were designed for family living this would reduce pressure on the supply of traditional 3 and 4 bedroom homes. “The current design of apartments is generally not suitable for long-term family occupation. We need to move towards the European style which are more suitable for long term habitation, particularly as we move towards more high density schemes in urban areas” Mr Stokes concluded. 10. Greater action needed on reducing the number of mortgages in arrears, particularly in the ʻBuy to Letʼ sector. August 5, 2014 in Uncategorized.